2016 saw peaks and valleys for hip hop. A few peaks for Golden Era fans came in the form of new albums from De La Soul and A Tribe Called Quest. Albums that were nostalgic and at the same time relevant. Do you need to be from the Era to create such projects? No. Could you be a student of that Era and create a comparable masterpiece? Yes (see Kendrick and Cole..also KRIT, Logic, Rapsody). Take Smoke DZA, the 33 year old Harlem emcee was not necessarily "in the game" during the '90s, but he was an avid fan/student thanks to his father. DZA grew up idolizing Jay Z and Biggie Smalls, but you can definitely hear influences from Dipset and Big L in his bars. As a young emcee, DZA began ghostwriting for hip hop artists in the early oughts. He finally put a solo project in books in '09 with his Substance Abuse mixtape. Enter Pete Rock, the Bronx producer STRAIGHT from the Golden Era. The living legend's professional career started with a few Heavy D production credits in '89 (as well as Groove B Chill, Brand Nubian, Kid 'n Play, and Main Source in the following years), but most know Pete Rock as one half of Pete Rock & CL Smooth. Their '91 EP All Souled Out introduced the world to one of the greatest emcee/DJ duos in hip hop history. Pete Rock is credited as being one of the earliest producers that infused jazz into the hip hop sound. So when I heard that one of my top 10 producers was doing a full length collab (been waiting about 6 years for that news), you know ya boy had to review it. 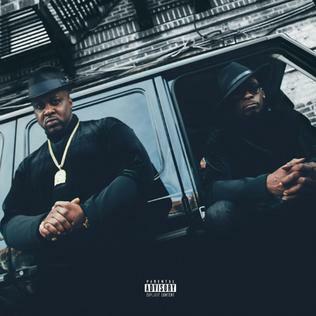 Don't Smoke Rock is the first tag team LP from Pete Rock and Smoke DZA. And the outcome is no surprise, this album is FUEGO (sorry, not very suspenseful). But if you read the mini bios above, and you assume they stayed true to the artists that they are, then it really shouldn't shock you. Pete Rock provides his perfected jazz/soul hip hop instrumentals, along with a few grimey NY beats. Either way, if you head ain't bobbing throughout, your neck might be broken. Smoke DZA approaches each track with the attention to detail that you get from a true student of the game. Like people who have stepped on the moon, getting a Pete Rock full length collab puts you in a rarefied air. DZA's bars show that the emcee took this opportunity seriously. And the features, all DEM features. You got: Dave East, Rick Ross (meh), Royce da 5'9, Cam'ron, BJ the Chicago Kid, Jadakiss, Styles P, Wale, Big K.R.I.T., Dom Kennedy and Mac Miller (plus two other emcees I've never heard of: NYMLo and theMIND). When it comes to the sound of the album, as mentioned above, you get that classic NY sound from an artist who has honed his craft for almost thirty years. Now let's run through a few tracks. The track "Limitless" serves as the real intro to the album and group. There is an "Intro" track, but that's just DZA setting up the album through a monologue. My only complaint with "Limitless" is that I feel they squandered the Dave East feature, allowing him to just contribute the hook. But I can look past this because DZA goes HARD. His bravado and braggadocio bars reintroduce him to whole new demographic of people who peeped this project on the strength of Pete Rock's name. DZA made sure his skill and confidence are front and center, and that he justifies the Pete Rock cosign. But the first track I heard from this project, the one that had my ears up like a jack rabbit, was "Milestones". THIS TRACK, features BJ the Chicago Kid on the hook, and two thirds of the almighty LOX on the verses. Now I'm not gonna say something blasphemous like DZA's bars are better than Jadakiss' or Style P's joints, but man, the kid came to play. DZA starts off the track with his throwback flow and street metaphors that prove he can get on a track with the best of them. And yes, when it comes to a street track, the LOX are the best of them. This track, this one I could have on repeat for days. On many tracks (with or without features) DZA approaches the Pete Rock instrumentals from a meticulous standpoint. What I mean is that DZA keeps it simple, in the best way possible. While his metaphors are complex, he doesn't overwhelm the tracks with flashy flows and lyrics. His cadence is crisp and his lyrics stay sharp. The whole point of joining forces with a legendary producer is to create a perfect pairing. The DJ is the most important person in hip hop. They hold all the keys, and they push the culture to the masses. If you give a chef a perfect steak, they won't drench it in sauce or go crazy with the sides. You let each component breath and shine. Pete Rock gave DZA the perfect steak. And DZA showed composure and constraint (and care) with his product. This is what a well oiled machine looks/sounds like. When you create a project with thoughtful lyrics and excellent production, you get a timeless work of art. If you're a fan of the Golden Era sound, BARS, or just timeless production, do yourself a favor and add Don't Smock Rock to your playlist.